I'm an Australian-born translator from Townsville, North Queensland, living in France since 1975. I love sharing my experiences of living in Paris and Blois in the Loire Valley! This blog tells me the things that interest me about travel. It's not just information to help with the practicalities of travel (esp in France) it also has really interesting articles about the experience. Because others can join in The discussion it becomes even more interesting. Down-to-earth, fun to read, personal and informative. Go Aussie in France!! I signed up to receive all the new posts from Aussie in France earlier this year. There are many bloggers about France but many do tend to be very similar. Aussie in France tends to stand out from the crowd with really interesting post and great photo's from her travels. Love Aussie in France, great information about what to do in Paris an dew here to go in the country. Interesting and informative. Humoristic, beautiful photos, fun travel advice and interesting perspectives and experiences. What isn't there to love about Aussie in France! One of my favourite expat blogs! I love reading about life in Paris and Blois from an Aussie perspective. Aussie In France Is like an appointment of pleasure on many subjects , about France and the world A very friendly writing : that is the best idea for me : a French woman to improve my English ! And to see how the French way of live is seen and explained Thank you so much and please go on . Sorry for my english mistakes but I'll try to support "Aussi en France" because it's a very interesting way to follow an australian woman, in her life, what she is thinking. Not only about the French way of life but also about other countries. When I read these posts I hear a voice and I travel! I love Aussie in France for the interesting mixture of posts, fabulous travel photos, and experiencing not only Paris through her words, but also the journey of buying and commuting to and from the french countryside. Fraussie from 'Aussie in France' has shown me great generosity, and has given me a welcoming reception to the world of blogging. Thank you Fraussie! Aussie in France has a way of making her readers feel like they are a part of her life. Whether On her travels between Paris and Blois, exploring Europe, or family reunions in Australia, Aussie's stories, her style of writing and her images make you feel like you're sitting with family listening to them share their experiences. I love reading about the adventures of this Aussie in France. Her blog is wonderfully written in conversationalist style, with wit and humour and interesting bits of information. To keep you in the picture, it is peppered with amazing photos so that you almost feel you have been travelling together. Wouldn't miss it! Aussie in France is a good mix of tips, places and facts, as well as having a personal story interwoven. Like a good travel novel, it's not just about the places they've seen but the things that happened to them along the way. Nice shots too. Qui-est le photographe? Love the easy manner of this wonderful travel blog. Makes you want to visit just about everything she has seen. Keep it up Fraussie! Great insider info into the best places to eat, things to see and do as well as fascinating cultural and language insight - a must for anyone planning to travel or live in France or just interested in mental escapism! When I read the blog,I always want to go to the end of the post. The writer's warmth immediately apppears. There is always something interesting to discover. I think it is the sincerity of the blog that makes me want to come back each time. And it helps my english ! Whether you're a Francophone on the other side of the world or an expat in Paris, Aussie in France is a delight to read. The intelligent posts are flavored with humor and provide helpful insights about life in France. As a fellow Australian living in France I appreciate Aussie in France for its lack of gushing romanticism. I like Fraussie's practical, no nonsense, but generous approach to her life in France. She's lived here a long time, and like many 'long termers' is often better at providing an insight into her adopted country than a native (and certainly better than a tourist!). She clearly enjoys sharing the quirky and the commonplace, and writes about it in a deceptively low key graceful style. This blog is full of interesting observations that relate not only to historical events but also more importantly to the follower of French life, to the. customs and social mores of the French.. It also reports on life in both the urban environment and the provinces between which social attitudes and lifestyle can differ markedly. These write-ups are full wry and amusing tales. Wonderful blog. Very informative. You always learn something about French history, culture or just daily life! Fantastic photos. Interesting and amusing and doesn't take itself too seriously. Great to also have the chance to experience village life as well as cosmopolitan Paris. Can't do without my daily French fix from Aussie in France! Aussie in France provides wonderful, entertaining insights into living in France. Whether it is attending a barbecue at an Embassy or picking mushrooms she is a great storyteller. I enjoy her sense of humour and her warmth which comes through her posts and comments. I had bookmarked so many of her posts and they became my go to guidebook when I recently had 3 months in Paris. In addition Fraussie has also initiated meetups between expat bloggers and is always there to proactively support and encourage fellow bloggers. Great reading style and an informative blog, I found it very useful when travelling recently in France. Liz from Aust. I started following this quirky and informative blog last December in preparation for a trip to France. I learned a lot about Paris (and the Loire); Fraussie's favourite walks, teashops, customs in the changing seasons, and history. I also learned about sewers, bridges, picking mushrooms, brocantes, fine dining (including things I didn't realise were edible), and, most recently and intrepidly, how to go about restoring a C16th fireplace. Each blog is entertaining, illuminating and generous from someone who loves her adopted country, but still sees it from a slightly different viewpoint. Aussie in France is prolific: a new blog every day. Its style is easy-to-read conversational, as if you were listening to a friend over a cup of tea. I love it, because it takes me away from my everyday life here in Oz, and gives me a snippet of what living in France might be like, when eventually I might get there! Aussie in France provides a fun and interesting insight into expat life in France. The posts are full of witty usefull tips and the pictures are beautiful. I just love to read this blog with the beautiful photos and the quirky, informative, fun-loving details. Often I read these late at night on my new smartphone - my bedtimne reading! It is my way of relaxing before sleeping and I dream of the places I will follow up from the blog for my future visits to Europe, especially France. I always enjoy reading this blog. If I can't travel there at the moment I can go there in my imagination fed by the wonderful descriptions and photos of life in France and fraussie's other travels. Recently it was especially interesting to read her accounts of her trip back to Australia. I also often enjoy Wednesday's links to other bloggers. It's inspiring as well to see the wonderful life fraussie has made for herself in France from the beginnings of learning basic French in high school, a long way from France and with very few French speakers to practise our french language skills on. I love to travel and Fraussie takes me on wonderful adventures and discoveries right from the comfort of my lounge chair. A fantastic and informative blog! Fraussie's anecdotes give a wonderful insight into life in Paris and Blois, along with great travel tips & itineraries to explore so many different destinations in Europe. My list of places-to-see grows every time I flick through Fraussie's travel photos. The variety of stories Fraussie posts, along with her weekly bloggers' round-up., means that Aussie in France is so much more than 'just' an ordinary travel or food blog. I really enjoy reading Aussie in France's blog. 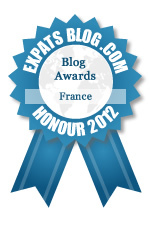 She writes interesting and informative posts and is happy to share her experiences in France. My daily must read. No two blogs are the same. Aussie in France writes about everyday events and shares her obvious delight in her adopted home. Her photos continue the journey for the reader where the words end. Thanks to Aussie in France. I really enjoy reading Aussie in France. As a fellow Aussie/Brit blogger in France I'm always interested to see Rosemary's point of view, learn from her, be inspired by her and travel with her. I absolutely love Rosemary's posts on Friday's French, where even after 17 years in France myself, I still learn new things. Rosemary is great at selflessly sharing other bloggers work which I appreciate enormously too.